Many agriculture and food processors face fines levied for discharging difficult-to-treat wastewater with high levels of biochemical oxygen demand (BOD) and fats, oils and grease (FOG). As a result, a simple, low-energy containment and dewatering system can be used for cheese waste treatment to reduce or eliminate sewer surcharges. Bishop Water’s solids management solution uses Geotube® technology to contain and dewater the solids. This allows the clean effluent to go to the sewer without being fined. A Geotube® container can be installed for a fraction of the cost of a conventional waste pre-treatment system and also provides highly effective retention and dewatering of process solids. Bishop Water has had many successful projects with agricultural processors, including many vegetable and potato processing farms. However, to test the effectiveness of its cheese waste treatment, Bishop Water performed a small-scale demonstration. The test was completed at a cheese factory in Central Ontario. 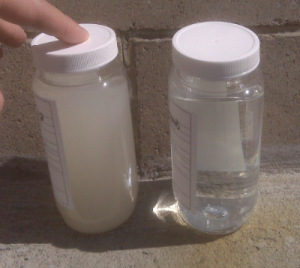 A sample of wash water was collected and conditioned with a flocculant so that the solids separate from the water, and a polymer which clumps solids together. The chemically conditioned sludge was poured into an onsite test kit, consequently demonstrating the dewatering capabilities of the Geotube® container. As the clean water rushes out via gravity, the flocculated solids are contained inside. The test showed that Bishop Water’s solids management solution could reduce TSS by more than 98%, BOD by 72% and phosphorus by 62% in treated effluent. In a full-scale system, the process solids would be pumped into a sizeable Geotube® container that enables ongoing dewatering. Therefore, this process also greatly reduces the volume of solids and water that are ultimately disposed of. This cheese waste treatment could create significant savings for factories facing large fines. Click here to learn more about Bishop Water’s solids management solution for BOD/FOG reduction for food processors. Contact us to discuss your treatment needs and to arrange for a dewatering test at your facility.